My style? Humm... I don't believe i got one really. I react to the situation with whatever i see fit for what i'm in. When it comes to Tekken, i believe it's much more concerning ones mentality above all. Mainly adaption. But, of course - thats easier said than done. Adapting is not as simple than just to say: "Adapt and you'll conquer". At first you need to learn - or gain knowledge. "Knowledge is power" is a wide known term, and it too relates to Tekken. Before you can learn to adapt, you need to learn what you're dealing with, and learn to use that. Your tool - In case of Tekken, Yoshi might be that tool. Compare it to a gun - before you can kill someone, you need to learn how to use your tool. So in order to do so, you must learn to aim at that someone and, hence, pull the trigger. When i play against other Yoshi' players in Mirror Matches, and beat them, it's because i've gained knowledge on my tool, learned how to use it, hence adapted to my tool in the shape of a habit, and hence reacting - strictly by reflex - on each situation. Therefore - Having 200+ secret setups etc. up your sleeve are less likely to win you the match than adaption. My "2 cents": Gain knowledge on your tool, then learn to use that tool, hence adapt to the tool and finally; React on the current situation from adaption. adapting to you oppernant is good, but it could also back fire if you take too long to adapt. At first you need to learn - or gain knowledge. "Knowledge is power"
If you know if there will be a low or up hit you will have a very good vantage!! fastlegs : adapting to you oppernant is good, but it could also back fire if you take too long to adapt. Ever looked at Tenshimitsu's Location? It says: "In your head" - and if you think deeper about it, these words contains more. Because that's where you wanna be if you're to win your fights - In your opponents head, knowing his next move etc. TEKKENbrother"YOSHEDO" : At first you need to learn - or gain knowledge. "Knowledge is power"
Not exactly as i meant it, but, yeah! I mean even I play mind games sometimes. So do i - it's an evil thing, and you just gotta love it! But, damn - Seems almost like if you wanna master the psychological aspects of Tekken, you gotta know just how the human brain works. Very interesting - but a little scary too. - I guess that if you know something about how the human brain works and such, you might be at a upper hand. It's been a long time since I've visited this site... (sorry guys) Now, let's see..
Tenshimitsu : Look at the fight as the overall process of learning. Both you and your opponent are learning each other's style. You must see through opponent's actions and do not let him predict your behaviour. So that's why repeating a set of moves isn't a good idea. If you're developing a strategy, you have to always keep in mind how your opponent might react. You have to create different situations, think of different endings: different possibilities. You must not have only one option. Natural "mix-ups" are of course programmed series of moves that most of characters have, but Yoshi is different. You have to make your mix-up strategies by yourself. Tenshimitsu : If you're interested on how to build strategies, I can write a tutorial. Hmm, seems I've missed alot. I play mind games too. But I usually start bfeore the match, get to know them and find out some info on which character they are good with and stuff. Then when the match is going, I purposely lose the first round (five round match). Learn the moves they use the most, if they are defensive or offensive. They main thing I look for in a fighter is wheather they come to you. Cause after a round or two, and depending on the character, it's easy to predict an opponents running moves. I never run towards my opponent, it seems a bit stupid to run into a punch. My fighting style is keep 'em down on the ground where they can't do much. Really, I think it's just stragedy dependant on the opponent. and the main theme is to adapt, just what Unknown said. Clar, the way you do Sword Sweep is widely known. Also, try to input 3+4 in the same situations: you'll see a very quick way of entering Indian Sit. Only ihopethisnamecounts have written true "combos". Combo is a set of moves that cannot be escaped once the first hit connected. I know this is well known, I just felt like putting it here cause maybe eager manjikai memebers might not be able to acess the FAQ files and it would be a shame if they didn't know the basic tricks. I personally didn't know this till I did it by accident. and I think I mentioned something about the indian sit trick in another thread. Adaptation is the pathway of evolution. best way to play mind games. 1) look you're enemy stright in the eye before even getting on the merchine, that way you make your prensence knowen. 2) watch videos if possible of your enemy, if they play the same chracter as you then there is a good chance you can learn something new. 3) study your enemys FAQ if you learn the reversals or blocks for the morjty of there move list and you start blocking and reversing during the match, you have them under pressure which means they will make mistakes. Hey guys, just noticed this thread. I'll keep this simple for now. Speaking strictly in terms of Tekken and Yoshi knowledge, this site has given me A LOT! Especially from Tenshi - who I seem to compliment so regularly, but she really was like a Yoshi mentor to me. Turns out she's a Yoshi forum mod on TZ now, no wonder she ain't around here no more! Anyway, I'd now like to give something back. Something big. Collosal even. It will be a while before I write it up and post it, but it will be massive, and it will not be in the form of a FAQ (because I understand that most Yoshi FAQs out there are incomprehensibly huge). It will be a step by step Yoshi tutorial, but it won't be a teaching guide. Rather, it will be a collection of MY Yoshi secrets, which I'm hoping will serve as a learning guide for the rest of you who want to better their Yoshimitsu game. For those that don't really know me, I'm a self-proclaimed Yoshi expert. I confess that I hardly play human opponents, which will be the most difficult part in writing this thing up (I've already got a name for it too), since many anti-CPU strategies aren't effective against real players. As a result, I will also be presenting the links and commentary to certain videos of other Yoshi players in action, and why I think their personal "secrets" are (in)/effective. I will also like to jot down some of my personal theories on Tekken playing, and on fighting games in general; things like differentiating between "Adaptation" and "Calibration" and how one's dynamic while the other's static (doesn't make sense now, hopefully it will when I get this project going). Anyway, let's hope I won't get too lazy as I normally do. This thing's been running through my mind for a few weeks now, and if I do decide to go through with it I hope it won't be for nothing, *cough cough*. I look foward to it! Wait with this until new YOT starts, Bigchief. New YOT will be a series of blog-like sections, which will be fully editable by certain group of users. 1. YOT Official: The articles already present, re-written from scratch. 3. Fan fiction: the place for Fan fiction writers. 4. Debating society: Off-topic articles which were the tradition of old-years YOT. 5. 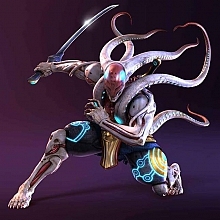 Links & media: a link blog containing all sorts of links, including links to external sources of Yoshimitsu match movies. 2. Members: after registering, they gain access to more posts, can subscribe to blogs, and post in section Links & media. 3. YOT Members: Can write articles in Debating Society and Links & media. 4. Fan Fiction Writers: Can write articles in Fan Fiction blog. 5. Strategists: Can write articles in Manji Dojo blog. This site will serve as our forum and Media gallery, but the main content will be present in the new shrine. I'm working on a theme. It will be finished very soon. So Bigchief, You can have your own category in the Manji Dojo blog, where you'll be able to post your own articles. Sorry for off-topic, i know that in DR yo can make old kamikaze(after it yo retur in indian)...do you know how do it? SS+2, d/f+1,2,D/B+2,2,2, and then kamikaze on opponent's backroll.